Paint Cannon Rentals for Special Events! At In Depth Events, we provide several types of special effects rentals for live events that use compressed CO2, including cryo jets and confetti blowers. However, our most versatile and exciting special effect rental for live events has to be our CO2 paint cannon rentals. These mixed media cannons use CO2 to broadcast paint, water, or other media nearly 70 feet into the air! Paint cannon rentals are used for all sorts of events. Since these cannons can be used for water as well as paint, you’ll see them used as water geysers at larger concerts and festivals to provide a cooling blast from the stage. 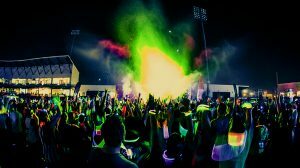 Of course, broadcasting paint can make for messy, fun college events, paint parties, EDM concerts and glow parties. These cannons can also broadcast dry media, such as blacklight reactive power, glitter, feathers, t-shirts – or anything else! These cannons are incredibly versatile: use them for a rapid fire confetti streamer cannon during the day, a t-shirt cannon in the afternoon, and then water geysers at night. They truly are limited only by your own imagination! There are several companies online that provide smaller paint cannons for rentals and they are happy to ship them to you and let you set them up by yourself. Our paint cannons are much more powerful that these smaller units. Our goal is for your talent and attendees to have a great time at your event. By providing professional technicians for your paint cannon rentals, we ensure that your event is both safe and FUN!! Our safety standards have allowed us to provide our CO2 special effects cannons, jets, and confetti services at concerts, festivals, and parties all over the United States. Make sure you choose the professionals at In Depth Events for your CO2 special effects rentals, paint cannon rentals and confetti rental needs. Ask Us a Question to see how we can service your next event. We look forward to hearing from you and working with you!